From what I saw on our recent back-roads trip across the country, the United States has NOT become one homogenized culture from East to West – it only looks that way from the Interstates. And though California has harvested much of the best of the East in creating the mix of cuisines, traditions, and cultures we call Californian, we did leave a few good things out. One of the missing pieces: the diner. The classic diner was a castoff railroad diner cars, clad in aluminum outside, and featuring big windows so you could monitor the passers-by on the street, a tiny kitchen, red-vinyl upholstered booths and a red Formica counter trimmed in aluminum, with red-vinyl upholstered stools along the counter. To the joy of children everywhere, the stools could spin. Fortunately, the diner also had waitresses of a certain age, who might be named Edna or Mildred or Gertie, but who could be counted on to tell children (and their parents, too) to stop fooling around and eat their vegetables. 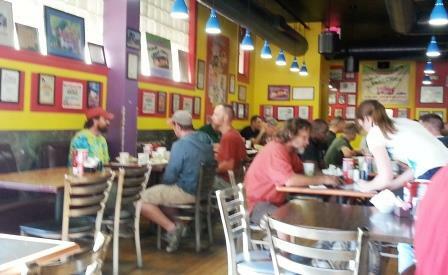 We had breakfast on the day of our East Coast departure at the Avenue Diner. We faced platefuls of eggs, potatoes, and bacon that would have daunted a lumberjack. As we leaned back midway, we noticed a buff gray-haired guy in a Marine Corps muscle shirt and steel-studded belt paying for his coffee just over the partition. It was Stephen Lang, the villainous Marine colonel from “Avatar”, in town to do a one-man dramatic show at the local Art Fest. We were star-struck, but the waitresses at the Avenue Diner didn’t miss a beat at having a celebrity stroll in for coffee. As cast-off railway dining cars became scarce, the diner evolved. It moved next to the hotel downtown as an inexpensive alternative to the hotel restaurant. It called itself a Coffee Shop, or even a Café. On the second day of our trip we passed up the swank historically-preserved Bremerhasset Hotel dining room and opted for the Crystal Café just across the street. At the Crystal Café, breakfast for two came to $13 including tip. The café was cheerful and clean, with lots of coffee mugs with regular patron’s names on them hanging on hooks behind the counter, and an honor library shelf circling the room with books in easy reach. The pretty young waitress was probably not named Mildred or Edna, but she was able to juggle orders, coffee cups, and questions from regulars and newbies with great aplomb. 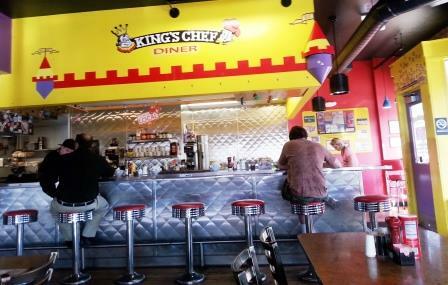 In Colorado Springs we wanted an early start, so we stopped downtown at the King’s Chef Diner, touted locally as offering “the best breakfast in the state of Colorado.” The honor library here featured a lot of castoff comic books, and the clientele was an intriguing mix of military guys in buzz cuts and street people with day-glo hair and pierced body parts. The host and waitress treated us with great deference, as exotic creatures who had wandered far from our ecological niche. I ordered the featured breakfast burrito. “Are you sure you want the sauce?” the waitress asked me anxiously. “It’s pretty spicy.” I assured her I could handle it. For a brief second I thought she was going to over-rule me in true diner fashion, but she must have been only a trainee. By the time the diner reached California it had mutated, adding sheltered parking, a drive-up window, and even putting the waitresses on roller skates. The drive-in’s did well for a while until the national chains muscled in. One by one they have disappeared, to my regret. Don’t get me wrong. You’ll see me enjoying patio seating at the local coffee shops and patisseries. But I miss having a take-charge waitress reminding me to eat my vegetables.